Your Projector Screen: How big should it be? Home / Tech Talk > Your Projector Screen: How big should it be? Your Screen: How big should it be? If you are setting up a home theater, you need to make some basic decisions right up front. First on the list is choosing the ideal aspect ratio for your theater. Should the screen be 16:9, which is the standard HDTV widescreen format? Should you go with 4:3 to match the old classic film format? Or how about the super-widescreen 2.35:1 aspect ratio that many contemporary movies are made in? If you have not decided which aspect ratio you want, read this before continuing. After you have determined the aspect ratio that is right for you, the next obvious questions are, "How big should the screen be?" and "What is the ideal viewing distance?" We get a lot of email asking these questions, and the answer is always the same: this is a personal preference. There is no right answer. However, there are some general guidelines that may be of help. I don't go to movie theaters much anymore, but the last time I did I selected my normal row, about two-thirds the way back. Another couple came in and promptly climbed the steps to the uppermost seats that were farthest from the screen. Another group arrived and chose seats about a third of the way back. Two teen-aged boys took the front row. Another dozen people filed in and took places randomly throughout the theater. The point is that everyone has his or her own preferences for seating in a movie theater. Some like a bigger picture with a wider angle of view; others prefer a less overwhelming presentation more in the center of their field of vision. The beauty of designing your own home theater with a front projection system is that you can set it up exactly as big as you want it. There are no formulaic "ideals." In essence, when you select the size of your screen for your given viewing distance, you are "choosing the row" you want to sit in. Now. Having said that, there are two things to be aware of. Both have to do with over-doing it. Since we have total freedom to go as big as we want, many folks err on the side of going too big and sitting too close, on the theory that if big is good, bigger must be better. And while it is true that size counts when it comes to home theater, it can be overdone to the point where it is not enjoyable. So as you plan your theater's layout, be aware that watching a very big screen up close is physically demanding. Have you ever tried to watch a tennis match from side court in the first row? Your head is moving constantly and your eyes go buggy. It is not a pleasant experience. If you go too big with your screen, you will have the same effect. The huge image might have awesome impact for the first 30 minutes of viewing, but it will be a chore to watch it for long periods of time. Before you choose your video projector and screen combo, one practical exercise is to mark out on your wall the size screen you think you might want. You can use black electrician's tape to define the corners of your future screen. Place your seating at the distance you prefer, sit down, and look at the marked out screen area for a while. Imagine action happening in the screen space and get a sense of how much work your eyes need to do to view the image. Work with the image size and viewing distance until you feel it is a comfortable solution for you and anyone else in your household who might be a regular viewer. Meanwhile, as you experiment with your ideal screen size, there is a second thing to be aware of. The more you enlarge a projector's image and the closer you sit to the screen, the more visible various artifacts become. By the way, the same is true of television. If you view a 2-foot wide television screen from a distance of 2 feet, you will see a blinding mass of scanlines and artifacts. But that same picture viewed from ten feet away looks great. There's nothing different about a projector except the scale. As a rule of thumb with 720p resolution projectors, a viewing distance of less than 1.5 times the screen width will get you into the trouble zone where pixelation and artifacts become more visibly intrusive. While it is true you have a very BIG image in front of you, these distractions can compromise viewing satisfaction. On the other hand, with the new 1080p resolution projectors, you can sit a bit closer, say at 1.2x the screen width, without worrying about pixelation and artifacts. That still might be too close for comfort from an aesthetic point of view, but some people like to have that very large image in front of them. The 1080p projectors make it easier to do that and still get a clean image. Keep in mind also that the screen's height will influence ideal viewing distance. Let's assume you have a 16:9 screen that is eight feet wide, and you find that 12 feet, or 1.5x the screen width, is a comfortable viewing distance. If you were to replace that 16:9 screen with an eight foot wide 4:3 screen, you might suddenly feel like your 12 foot viewing distance is too close--for any given screen width, the 4:3 format is always a larger surface area than 16:9, and is thus more visually demanding. You might want to move back a few feet to take it all in. These are just rules of thumb. Clearly the projector you choose will have some impact upon ideal viewing ranges. 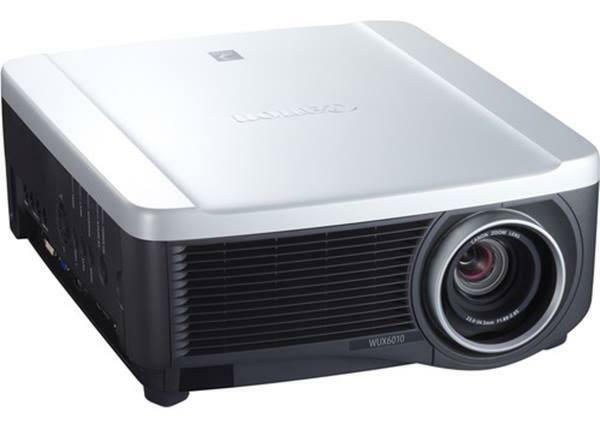 1080p resolution projectors will allow for larger screens and closer viewing distances without compromising image integrity. On the other hand, entry level 480p projectors require you to sit further from the screen if you want to avoid visible pixelation. Choosing the right screen size and the right aspect ratio will have a huge impact on your long term enjoyment of your theater. So give these matters serious thought. When it comes to a successful home theater design, these factors are much more important than the projector you choose.